So, it's the first Saturday after back-to-school. How did everyone fair? Hannah is a January baby so she won't start kindergarten until next fall. However, I work on a university campus and she attends preschool there so it was a hectic week for us nonetheless! Fresh books and new clothes can go well with a new beauty routine, and P&G have some great products to help you look and feel your best as temperatures start to dip. 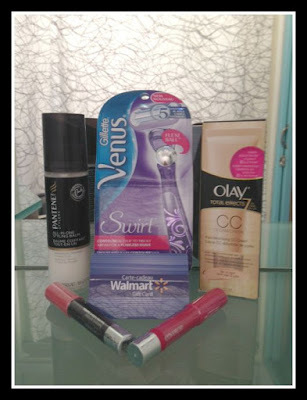 Venus Swirl Razor - I am loving the FLEXIBALL™ on the new Venus Swirl Razor. I can still wear my skirts to work, and the swirl helps me get a closer shave ensuring no missed hairs (which are really the worst). I also like how long the blades last - it's slightly more expensive, but totally worth it in the long run. COVERGIRL Colorlicious Jumbo Gloss Balm - I LOVE the Blush Twist colour so much this product has become akin to my iPhone - I never leave home without it. I love how it makes my lips soft but not sticky, and I love the tint of colour, which keeps me appropriate for work. Pantene Pro-V Stylers All-in-One Styling Balm - Some mornings I have time to blow dry my hair, and some mornings I don't. Regardless of how I style it, this product keeps my hair smooth and smelling great! Do you change your beauty routine to prepare for fall? One lucky YYZ Bambina reader will win a Back-to-School Beauty prize pack! 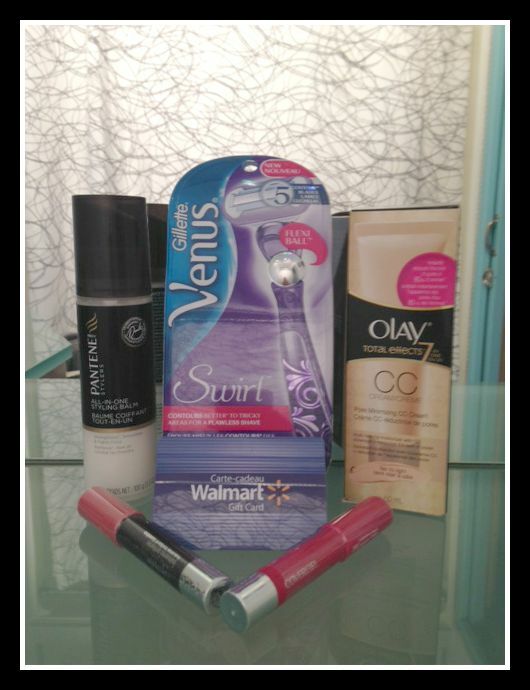 P&G has only provided me with the product that I am using as the prizes for this contest. The contest is not otherwise endorsed, designed and/or administered by or associated with P&G.By entering the following contest you are accepting that, if you win, your contact information will be shared with a P&G PR and shipping agency for the purpose of mailing your prize. Please allow 4-6 weeks from the contest closure date to receive your prize. Enter using the Rafflecopter by September 27th, 2015. Sometimes. I usually go from a tinted moisturizer in summer to just a reg moisturizer in winter! Usually go with a bolder lipstick colour. Generally I keep my beauty routine the same in the fall. I don't change too much. I just don't wear as much SPF lotion. I do! I actually wear more makeup and moisturize more. No, I keep it the same. Basically the same for me.i may change up the eye shadows and nail polishes to a bit darker fall shades. I'm pretty much the same year round, except for maybe swapping a brown mascara for black. No, I pretty much keep the same routine all year. It stays almost the same, I just use some darker shades. My wife says she doesn't change much to her fall beauty routine. She puts on more moisturizer to prep her skin for the colder and drier months. Not really, I use sunscreen year round and wear the same makeup. I sometimes am a little more casual with my hair if I'm going to be wearing a winter hat. I try to moisturize more as well as consistently. I don't change my beauty routine in the fall. My beauty routine doesn't change in the fall. Yes, I switch out my light summer moisturizer for a thicker cream and also switch from bronzer to a rose blush. I also change my lipstick with whatever colour is in season. Thanks for the chance to win! I keep my beauty routine the same in the fall. It does not change much. But I make sure to stock up on things during Back to School so I don't run out of stuff. I moisturizer a lot more in the fall. I use a lot more lotion my skin starts getting dry in the colder seasons. I don't change my routine until the harsher winter weather sets in. I switch to a heavier moisturizer and use more conditioner. Not really! Maybe some darker color in my hair! I don't change it a lot, although when it gets cold I use a moisturizer. Yes, I use heavier moisturizers and darker colours. I don't change much except for the thickness of my moisturizer. Not really, maybe extra moisturizer but that is about it. Still use sunscreen and that's about it! I switch to browns opposed to bright colors! I keep the same routine pretty much all year! I use more moisturizer and make sure my face creams have sunblock in them. I tone down the bronzer and go for a darker lip. Yes i don't wear as much bright colors as i do in the summer. I tend to add more hydrating masks and serums into my Fall beauty routine. I also exfoliate more too. I use more moisturizer as I find my skin starts to dry out. I moisturize twice a day. I do, my skin gets very dry with the indoor heat. Summer is when I eliminate moisturizing in the mornings - in the heat - face feels like it is melting. In the fall I use lotion day/night.....Cool air and vibrant skin. I usually switch to a different perfume in the fall. No I don't usually change my beauty routine in the fall. I tend to wear darker shades on my lips and eyes. I accommodate for the changing humidity, slightly. I find I don't have to wear as many oil-free products in the fall. Yes, I change to a moisturizer with sun screen added whereas in the summer I use a sun screen separate from my moisturizer. I do not change my routine in the fall. No, I do not change my beauty routine in the fall. Yes I do change my beauty regime in the fall because I need more moisturizer and not as much sunscreen as in the summer. Yes, I switch to colours that are more autumnal for my nail polish, lipsticks and eye shadows. I use a bit more moisturizer and I wear makeup more often since there are less swimming/sunscreen type moments. I use more moisturizers in the fall.